When the co-chiefs of Lamb’s Players Theatre, Robert Smyth and Deborah Gilmour Smyth, finally became available, her dream came true. She added Intrepid resident artist Erin Peterson, and L.A.-based Old Globe regular Ross Hellwig to the mix, and magic ensued. This is the best production of the Tony Award winning play I’ve ever seen, and that includes the acclaimed 1966 Elizabeth Taylor/Richard Burton film. Consummate actors both, the Smyths were made for these roles. Their experience, familiarity and expertise bring George and Martha into sharper focus, and their magnificent way with the language underscores the brilliance of the play. They begin this 3-act, 3-hour marathon of psychological brutality on a wonderfully playful and humorous note. Then, at 2 a.m., after an evening of drinking at a faculty party at the college president’s house (the President happens to be Martha’s Daddy), and their late-night guests arrive: Nick and Honey, a young couple new to the small Northeastern college. Nick has just joined the Biology department; George is in History (“George is history,” Martha cruelly claims). Then the Fun and Games begin, in a booze-riddled night of mutual denigration and recrimination, where everyone’s most painful secrets are exposed and irreversible damage is done to both marriages. Although their banter and rapid repartee are vicious, George and Martha are just “exercising,” as he puts it. Their ruthlessness is a weird, warped expression of their deep and abiding love, even though it’s fraught with lifelong disappointment. Over the course of the long, anguished evening, we come to see that Nick and Honey will most likely turn into George and Martha, older, bitter and fueled by alcohol, but probably without the endlessly snappy badinage and the fantasies to keep them going. This is a phenomenal production of a devastating play. The scenic (Mike Buckley), costume (Jeanne Reith), sound (Kevin Anthenill) and lighting (Curtis Mueller) design are pitch-perfect. The performances are superlative: searing and intense. It would be hard to imagine a better George and Martha. Gilmour Smyth is spectacularly wild, raucous, alcoholic, out of control. Smyth’s George exudes tensile strength; though she’s relentlessly beaten him down, he maintains control and flawless, injurious aim when he lets go his barbs. Their tempo and tone are nonpareil. Hellwig’s Nick is precisely the beautiful monster George pegs him as: the set of soulless, destructive chromosomes that will one day take over the world (though Nick doesn’t realize he’ll come tumbling down with it). Peterson’s Honey has a slow burn, but once she gets drunk, she’s a doozy. Christy Yael-Cox has become one of the strongest directors in town. In 2014 (“All My Sons”) and 2015 (“The Quality of Life”), she helmed the Outstanding Production of the Year, as voted by the San Diego Theatre Critics Circle. Her sense of pacing and timing is impeccable; she encourages her actors to burrow into a deep well of emotion, and she can mine the humor in even the darkest of places. And all, always, in service of the text, which she clearly respects enormously. Despite its long running-time, this gripping, riveting production flies like the wind (to paraphrase Honey). Sometimes it’s played like a fantasy or fable, the Founding Father and Mother (George and Martha) ripping away at the fabric of American family, decency and morality. But this production feels so real, it hurts. Still, I miss the seminal scene between Honey and George. When the trustees of Columbia University refused to consider the play for the recommended Pulitzer Prize in 1963, because of its use of profanity and sexual themes, there was actually no swearing in the text at all. But around 2006, with an upcoming revival and tour (Kathleen Turner, Bill Irwin), Albee went back into the piece and, presumably to keep up with the times, he added all those curse-words he never put in the original version. He even included an F-bomb, while deleting the moment that Honey gets to describe her own hair-raising acts and motivations in the baby-making business at home. During one of Albee’s many trips to San Diego (in support of the Playwrights Project and the SDSU Design Performance Jury, a guest of Deborah and Beeb Salzer), I asked him why he’d omitted that scene. “It wasn’t necessary,” he said curtly, as is often his style. I still think it gave Honey’s character the added dimension all the others are afforded. Yet, with Albee known for exercising rigorous control over every production, the new version is the only way the work will be performed henceforth. If you can handle the play’s ferocity, you will appreciate its genius. Miss this exquisite production at your peril. 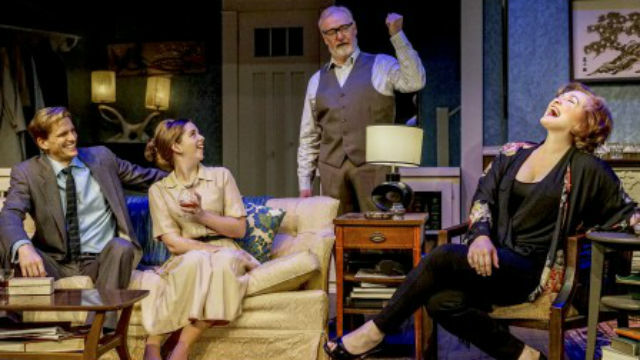 Performances are Thursday at 7:30 p.m., Friday-Saturday at 8 p.m., Saturday and Sunday at 2 p.m.
Posted in Arts | Tagged Christy Yael-Cox, Edward Albee, Horton Grand Theatre, Intrepid Theatre Company, Pat Launer, play, review, Who's Afraid of Virginia Woolf?